Spiky, very fast grower, small, vigorous, energetic, ground cover. 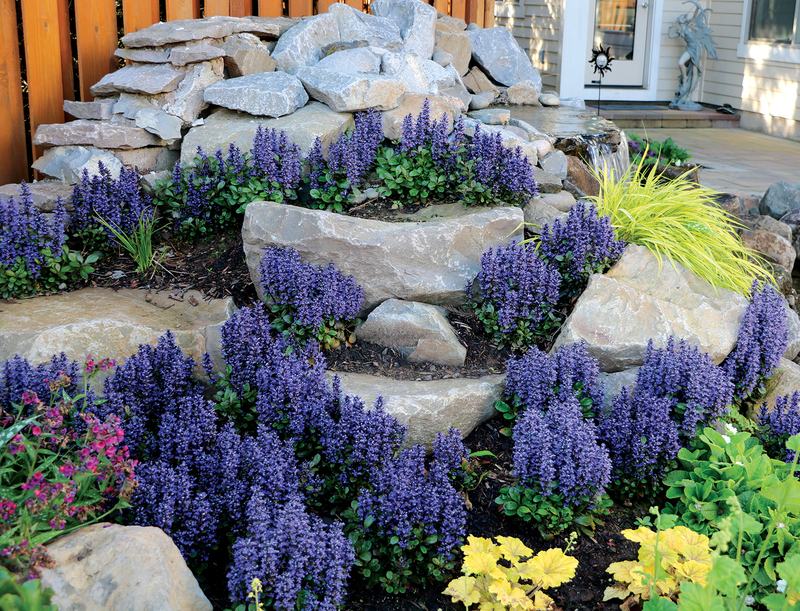 Those are just but a few of the adjectives that describe the herbaceous ajuga blueberry’s prowess in the garden. Commonly known as Carpet Bugle, this blue flowering perennial plant grows fast and stays evergreen all around the year. It has a dense green foliage that gets covered with blue flowers whenever it is blooming time, during the spring. This carpet bugle blooms with blueberry-blue flowers which clump together to form a dense mat of eye-catching rossetes. These flowers are beautifully nestled on top of 8-inch spikes. While the bugleweed plant is small, it is also tough and weather resistant. However, the small size means that it forms a good carpet. Sometimes, a single plant may spread out to 28 inches in width, covering the ground well. All year round, the tiny leaves stay green, forming a striking contrast with the dense flowers. Buying the Carpet Bugle for your garden will be a large step in achieving the kind of beauty everyone admires in a garden. Gardeners hold the plant in high esteem because of its resistant nature and affinity to love shades. The plant is low-maintenance. It needs very little tending once it’s firmly set up in the soil. Mostly, it will thrive in average well-drained soils especially in shaded areas under trees, or banks facing away from the sun because it needs partial sunlight to grow well. In addition, a great thing about this plant is the fact is that it is deer resistant. When buying the Ajuga Blueberry Muffin, keep your eyes peeled for powdery mildews. Though it is hardy and generally resistant to pest attacks, it is highly susceptible to root infections. This means that you have to treat its roots during planting. Its root issues aside, it serves great as a ground cover plant, and performs nicely in containers too. Blueberry Muffin Ajuga grows in 3.5 inch pots.